Going to a Conference! ~ No Limits on Learning! Last week, I found this blog post from Imagine Easy Solutions that encouraged educators to blog during their conference sessions...but I forgot about it until now, so I will start tomorrow. I didn't arrive in Austin until almost noon today, and I only attended a couple sessions, so perhaps an end-of-day reflection is OK for today! 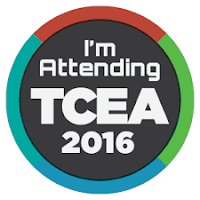 #TCEA16 will probably trend all week. I was almost overwhelmed yesterday (before I even arrived at the conference) trying to keep up with the flood of ideas, posts, and resources. Following giant conference hashtags is now at the top of my to-do list. I can't believe how much I'm learning through Twitter. TCEA organizers have their conference down to a fine science, and I appreciate all of the time and work it must take to pull off an event of this magnitude! Check-in was a breeze, the conference app is constantly updated, and there are signs, marquees, and volunteers everywhere, so my questions are already answered! It is hard to attend a ginormous conference by yourself. This year is so much better, though, because I have made so many connections during my time at my new job, so I keep running into people I know (or who know me!) Whether it's in the hallway or in the fast-moving Twitter stream, it's awesome to be a bit more connected this year. ...but attending a ginormous conference can also be overwhelming, so quiet time at the end of the day is a must for me! I didn't put in a proposal to present this year, and I kind of miss presenting, but I must admit, it is more relaxing to "just" be a learner and participant. At a technology conference, so many people are glued to their devices, so I always appreciate when the presenter prompts us to "turn to your neighbor and share..." In my opinion, one of the best parts of a conference is making connections, and that's a bit difficult when you're constantly looking at a screen. I am such a math-person (linear, concrete-sequential, etc.) and I have planned PD sessions for many years, so I prefer presentations that are super-organized, purposeful, and thoughtful. Your slides don't have to be designed by a graphic artist, but please follow some kind of outline, provide an essential question, or explain the session goals. I caught a Google Hangout (on Air) reflection session from one of our district partners, and I thought that was an awesome way to end the day! The tech leader had several of his teachers tell one or two of their favorite take-aways from the day, and it looks like he plans to follow this model all week. How awesome is that, to model the tool, get the teachers reflecting, and document their learning!? In other news, I helped moderate the very first Twitter chat for our service center, so that was an accomplishment for the evening. I worked with a science consultant, and we have the next several months of topics planned. (#R10chat) It was a small group, but we know we had lurkers and a few who were new to Twitter, so to get more people excited about connecting is exciting! Looking forward to another day at #TCEA16.